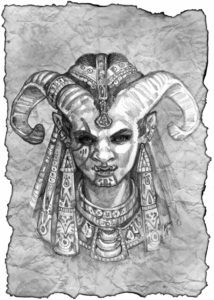 The campaign is still going on, and you can catch up with our ongoing adventures in the Legends of Earthdawn podcast. The story is several sessions behind where we are in our actual game — as of this post, the characters are Second Circle (or just reached Third), but we just wrapped up a major arc and had a big chunk of downtime to reach Fifth Circle (and I think some of characters might be nearing Sixth). I want to post the current version of Virag, but before I do that I should probably finish up this series. We last left off with talent selection. For magicians, that is followed by Spell Selection. You receive the character’s Perception Step in points for spells. First Circle spells cost one point, while Second Circle spells cost two. Personally, I find it hard to buy Second Circle spells with starting points. The main reason for this is because of the limitations on casting that spell to start. Even if you were to raise one of your starting spell matrices to Rank 2, you still can’t put a Second Circle spell in it. This leaves only Grimoire Casting and Raw Magic as your options. I’m not crazy about either. Raw Magic… well, it’s Raw Magic. Grimoire casting is actually okay in ED4, but because I cut my teeth on first edition (where you can’t cast spells you know from a grimoire) it’s not something that pops into my mind. It’s also not particularly well suited to combat… and outside of combat, there’s typically no reason you can’t reattune your matrices for the spells you need. All that said, Virag has Perception Step 7, and therefore gets 7 points worth of starting spells. Here are the ones I decided to go with, along with the brief reasons why. Astral Spear: A little bit better range and higher base damage than Spirit Dart (the other damage spell I took). Slightly less useful because of the need for a thread, but the boosted damage from extra successes is nice. Ethereal Darkness: One of the iconic Nethermancer spells. I don’t get to use it a lot, but I still like it. Experience Death: Another iconic Nethermancer spell. An excellent (if dangerous) investigative resource. Life Circle of One: A useful anti-undead and Horror construct spell. You never know when you’re going to run into those. Shadow Meld: Boosts party stealth, making it more likely to avoid conflict (or get the drop on your enemies). These are desirable goals. Soul Armor: Bonuses to Mystic Armor can be useful (though, in fairness, I don’t think I’ve used this that much). Spirit Dart: Damage and range aren’t as good as Astral Spear, but the Mystic Armor debuff is nice, and it doesn’t need a thread. This means that, round-for-round, it does more damage than Astral Spear. I didn’t take Bone Circle because it’s a spell that’s not well suited to a game with a lot of travel. Dark Messenger is a nice spell, but isn’t much use if you don’t have the Command Nightflyer talent (or some other way to get an appropriate animal under your control). Soulless Eyes didn’t really fit with my concept of playing against the “spooky” archetype. Spirit Grip does the same damage as Spirit Dart, and has a slightly better debuff effect (reducing Defense Ratings instead of Armor), but it’s Touch range, and I wasn’t planning on being in close combat. In this step, you assign ranks to starting skills. You get 1 rank in an Artisan skill, 2 ranks in Knowledge skills, some Language skills, and then 8 more points to spend on any Novice-tier skills you want. I went traditional with my Artisan skill and took 1 rank in Robe Embroidery. There wasn’t anything different I could think of that fit my concept (although thinking back on it now, taking drawing or something like that to sketch my observations of astral fauna would be an interesting approach). For Knowledge skills I took 1 rank in Nethermancer Lore and 1 rank in Spirits and Astral Fauna. Both of these fit the character concept of being an astral naturalist. Language skills are pretty much predetermined: speak dwarf (Throalic) and troll, read and write dwarf (Throalic). For my free skill ranks, I like to pick up things that are either useful, or make sense given background or concept. I put an additional rank into Spirits and Astral Fauna since that fit my concept. I put 1 rank into Physician — a generally useful skill, it’s worth somebody in the group having it, and it’s often conceptually appropriate for a Nethermancer or Elementalist. In my efforts to play against type I decided to pick up a couple of social skills: 2 ranks each in Etiquette and Flirting. 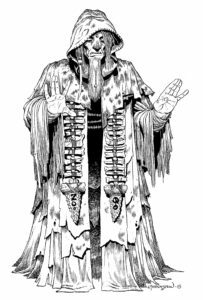 Nethermancers don’t get much in the way of social abilities (at least, ones that don’t rely on fear or intimidation), and I didn’t conceive of Virag as the stereotypical antisocial, reclusive Nethermancer. Understanding some of the nature of death makes her value life, and she intends to live (and enjoy) it. Finally, 2 ranks in Melee Weapons, just in case she finds herself in a situation where she needs to hit stuff with sharp or heavy objects. The reason I distributed the rank points the way I did was because of the Attributes associated with the skills. This put all of the general skills I picked up at Step 8. As I have mentioned a couple of times in this series, I shoot for that Step 8 when I can since the 2d6 has a significant advantage over the d12 of Step 7 (and it’s even more important when you can’t bring Karma to bear). Adventurer’s kit (Free): Includes a backpack, bedroll, flint and steel, torch, waterskin, and a large sack. Artisan tools (Free): Embroidery tools (since I chose Robe Embroidery as my artisan skill). Large knife (Free): Has to be Size 2 (since Virag is a troll). Grimoire (Free): Contains all my starting spells. Traveler’s Garb (Free): Includes soft boots, shirt, belt, breeches, and a traveler’s cloak. 1 week trail rations (Free): So you don’t starve on your first adventure. Broadsword (25 silver): My backup weapon in case I need to stab something. Hardened Leather Armor (50 silver): Don’t go adventuring without protection! More expensive because I’m a troll. Writing Kit (23 silver): To record my experiences and observations. Not a bad start. There’s more I want (a Physician’s Kit and extra clothes are high on my wish list, but hopefully our first adventures will provide some extra cash). Some of this I have already dealt with as part of my conceptualization of Virag. I didn’t want to detail too much history for a few reasons. First, I like it as a GM when my players give me empty space where I can attach potential hooks (with their permission and consent), so I like returning the favor when I have the chance. Also, since I’m not sure what shape the game is going to take, I didn’t want to close off potential options ahead of time. Also, there wasn’t a strong “campaign concept” that had been pitched to us. Since I wasn’t sure what shape the game was going to take, or where we were going to end up, I didn’t want to establish strong character elements that would either close off potential avenues later, or be potentially irrelevant (for example, if we’re not going to be dealing with the Crystal Raiders at all, establishing a strong background in that regard doesn’t do much except inform personality). And, since several of my fellow players were new to Earthdawn (from both a setting and system standpoint), I wanted a relatively “generic” background so as not to hog the spotlight with my extensive knowledge, either from the other PCs, or to force the GM to direct the campaign in service of my character. So, the concept and personality I had developed early on suited my needs here. I also enjoy discovering my character through play, giving myself (and the character) space to grow and explore. It’s a bit meta, but it’s one of my favorite aspects of creating an RPG character. I’m… semi-immersionist (if that’s a thing). I like “getting into character,” but I also have a bit of my mind that’s apart from that; a kind of “author’s view” that looks at the character’s role in the broader story. And that’s Virag. The game has been running a couple of years now, meeting monthly (give or take). We’ve advanced, and Virag has developed in some ways I didn’t quite foresee. She has ended up as the de facto group leader, and the epicurean aspects of her personality I originally conceived haven’t really come out as much. I still downplay the fear-based aspects of her Discipline, which means when I break those out it’s all the more significant. That wraps things up for now. I’ll be returning at a later date (not too much later, I promise), to go through Virag’s Novice-tier advancement and explain my choices through there. Join me then! This entry was posted in Earthdawn, Role Playing and tagged Character creation, Virag on March 9, 2019 by Josh. For those who care, I’ve finally gotten around to migrating the blog posts from the previous version of the site to the new location. This gives you a couple hundred old posts going back over several years. Some of the links are broken, and images need to be moved over. That will take some time as I go through, post by post, to add categories and such. I still have a bunch of other content to move over, so perhaps I’ll get to that at some point. This entry was posted in Website on October 8, 2016 by Josh.